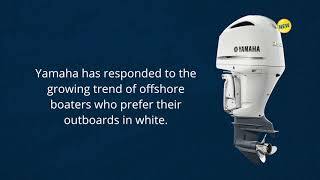 Meet Yamaha’s award-winning V6 4.2-liter outboards. Fusing power, efficiency, speed and light weight, their intelligent design absolutely sets the standard for offshore performance. And now, you can add versatility to that list. With all V6 4.2L models – F300, F250 and F225 – available in both mechanical and digital control, you can step up your power, without rebooting your rigging. Seventeen percent more fuel efficient at cruise RPM*, up to 73 pounds lighter than some competitors and more than 10 years of proven Yamaha reliability. That impressive resume now includes the option of a 35-inch shaft and the choice of colors for the F300 DEC model – available in new pearlescent white, as well as signature Yamaha gray. Offshore V6 4.2L outboards are available with either mechanical (25" shaft) or digital controls. That gives you the freedom to increase your horsepower and your displacement without replacing your rigging. Yamaha’s 4.2-liter V6 Offshore outboards feature plasma-fused sleeveless cylinder walls, which are 60 percent harder than steel. That means larger cylinder bores for increased displacement, resulting in more power and torque, without increasing outer cylinder dimensions. It also results in dramatically lighter weight and better cooling, and “micro-textured” cylinder walls that help decrease friction loss, and further increase performance and enhance reliability. Our 4.2-liter V6’s are up to 17 percent more fuel efficient at 3500 RPM than other four-stroke V6's. * For maximum power and efficiency, electronically controlled throttle valves work in concert with Precision Multi-Point Fuel Injection to ensure a precise mix of air and fuel. In addition, six individual sensors constantly provide vital atmospheric and engine conditions to the Engine Control Module (ECM), which makes adjustments for performance. From the top of the cowling to the tip of the propeller shaft, every ounce of weight-savings has been realized for maximum performance without sacrificing durability. There’s even a new advanced polymer composite lower engine pan that lowers weight and increases corrosion resistance. The 4.2-liter V6's are up to 73 pounds lighter than other four strokes in their class, at 562 pounds (digitaL and 551 pounds (mechanical). Yamaha’s Variable Camshaft Timing system advances and retards the angle of the intake camshaft to dramatically increase power and throttle response in the low- and mid-RPM ranges. This feature helps Yamaha’s new 4.2-liter big-bore V6 outboards deliver awesome hole shot and mid-range acceleration. The Yamaha F300 is up to 19% faster at cruise RPM than other 300-hp four-stroke outboards. * Cruise RPM is where most offshore outboards are typically operated, meaning you get there faster, using less fuel, than competitive models. *Testing conducted by Yamaha at Yamaha’s test facility on a Grady-White® 257 Advance, with each boat rigged for maximum performance. All Yamaha V6 4.2-liter outboards feature a proven cowling drain system, to easily and efficiently drain away any water that enters the cowling during normal engine operation. Incoming air is routed through a labyrinth of passages that trap and drain water before it enters the engine’s intake, for maximum reliability. With up to 70 amps of total alternator output, our V6 4.2-liter outboards have over 29 percent more charging power than other V6 four strokes, and ample charging for an array of on-board electronic devices. Our Variable Trolling RPM Switch (VTS®) allows you to adjust trolling speed from 600 ~ 1000 RPM, in 50-RPM increments, for consistent trolling speeds in any conditions. Command Link Plus® features a 6-inch high-contrast, multi-engine, LCD or an-all new 7-inch touchscreen display; digital electronic controls; key switches and start/stop panels; and more flexibility and information than ever. Its optional Y-COP® theft-deterrent system disables the ignition and fuel systems while docked. Our patented Shift Dampener System (SDS™) absorbs the resulting force of shifting gears, greatly reducing the noise commonly associated with shifting. Choose the look of your V6 F300, which is now available in either signature Yamaha gray or new pearlescent white.